International Journal of Research in Health Sciences,2014,2,3,867-870. 1- Associate Professor of Medicine. 2- Assistant Professor of Medicine. 3- Senior Resident in General Medicine. 4- Postgraduate in General Medicine. 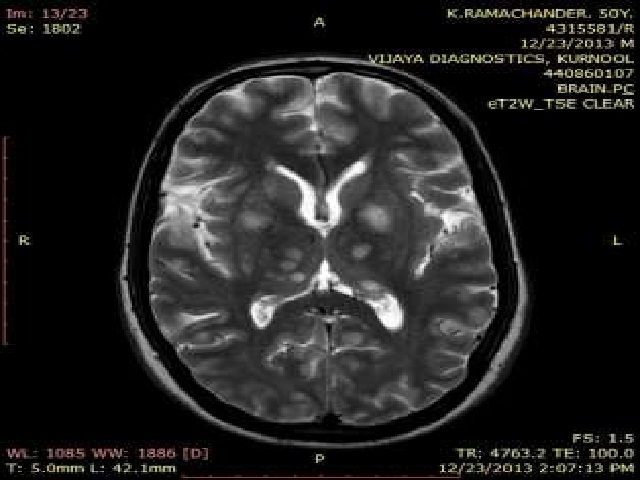 5- Senior Resident in Radiology, Kurnool Medical College, Kurnool, Andhra Pradesh, INDIA. Toxoplasma gondii is an intra cellular protozoan. it is the one of the most common focal neurological disease in patients with HIV/AIDS. Because of defective cell mediated immunity, patients are at a higher risk of developing toxoplasma encephalitis. A 50 year male presented with fever with altered sensorium and focal neurological deficit. An imageology shows multiple ring enhancing lesions in basal ganglia and subcortical regions. Toxoplasma serology revealed raised IgG antibody levels and positive PCR test for Toxoplasma organism. Based on MRI and positive serology a diagnosis of cerebral toxoplasmosis was made.